If you’re planning a late spring or summer getaway to the Hill Country, make sure you take a taste of the region’s famous peaches as well as our native Texas wines. Visitors have their pick of many peach orchards and farm markets around Stonewall and Fredericksburg. From your accommodations at Fredericksburg’s Wine Country Cottages and Wine Country Farmhouse, you’ll find several south of town, and at least six on the way east toward Stonewall. From May through August, visitors to the areas around Stonewall and Fredericksburg enjoy the sweet juicy taste of peaches fresh from the orchard and transformed into everything from ice cream to preserves to pies and cobblers. Often, these orchards and farms have been owned by the same family for generations. Many of the roadside stands selling peaches and peach products also offer fresh berries, melons, and assorted vegetables in season. Each peach variety reaches it peak for only about 10-20 days, so it’s a good thing Hill Country orchards grow so many different kinds. Since harvest dates can vary as much as a week or two depending on the weather, many orchards post updates on their websites. Clingstone varieties like Springold and Regal mature the earliest in mid-May, followed by June Gold and Ruby Prince later in the month through early June. 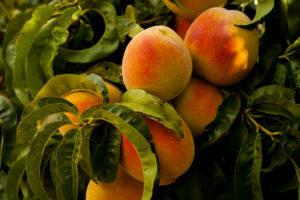 Semi-freestone or Semi-cling peaches, meaning the fruit will separate from pit, ripen in June. Watch out for Sentinel, Gala, and June Prince by the middle of the month. Freestone peaches have the longest harvest season in Terxas, from mid-June through late summer. Harvester and Cary Mac varieties usually ripen first, then Majestic and Loring, the favorite of many local growers, followed by Dixieland, another favorite. If you can’t getaway to Fredericksburg before August, look for two more royal peaches – Flame Prince followed by Autumn Prince. Stonewall celebrates its reputation as the peach capital of Texas with its JAMboree Peach Festival and Rodeo each June. Their 57th Annual Jamboree is June 15-16, 2018. It’s a hometown festival complete with two nights of rodeo and dances, a parade, Peach Queen, peach eating and pit spitting contexts, baking, preserve and salsa contests, live music, and more. Imagine the fun of picking fresh ripe peaches and enjoying a picnic lunch in a Hill Country orchard this summer. Perhaps choose a different variety at a farmstand to bring back to your cottage for a late afternoon treat in the garden with a chilled bottle of chardonnay from one of our Hill Country wineries. The peaches are starting to ripen, so don’t wait to give us a call or go online to book a “peach” of a stay with us. This entry was posted in Festivals, Food & drink, Uncategorized and tagged Hill Country Peaches, Stonewall JAMboree Peach Festival & Rodeo, Texas food festival by admin. Bookmark the permalink.